Two recent, critically-acclaimed MR James adaptations __ A View From a Hill (2005) and Number 13 (2006). 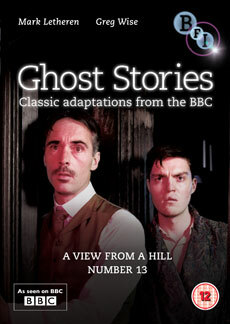 As a Christmas treat in the late 1960s and 70s, the BBC produced adaptations of ghost stories based on the works of MR James, the Cambridge academic and author of some of the most spine-tingling tales in the English language, which were broadcast to terrified viewers in the dead of winter. This was a tradition that was briefly revived by the BBC between 2005 ad 2010. This final collection in the BFI's series includes two more recent MR James adaptations: A View From a Hill (2005) and Number 13 (2006). Both were screened to acclaim from critics and fans, and are regarded as perfect complements to the vintage BBC Christmas Ghost Story productions. Ghost Stories for Christmas with Christopher Lee - 'Number 13 by MR James' (Eleanor Yule, 2000, 30 mins): Ronald Frame's adaptation is brought to life by horror maestro Christopher Lee. Illustrated booklet with newly commissioned essays by Jonathan Rigby and Simon McCallum.